NCBP Faculty Are Nationally Recognized Scientists and Educators. 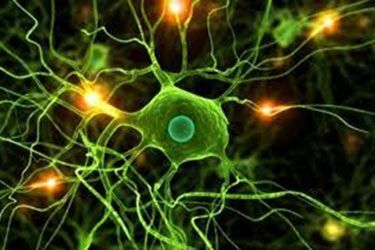 Research in Neuroscience, Cell Biology, and Physiology is focused on thematic interests of cellular signaling processes. Our research laboratories are highly interactive and study critical aspects of human health and disease. Neuroscience: normal and injured spinal cord, brainstem and peripheral nervous system. Spinal motor circuits in health and neurodegenerative disease, neuroprosthetics control, brain-machine interface. Our research laboratories are highly active and interactive, helmed by faculty who are world leaders in their areas of specialization. Our research areas can be divided into three groups, but interests and skills frequently overlap. Research in neuroscience focuses on function and structure of the normal and injured spinal cord, brainstem, and peripheral nervous system. This work is directly relevant to studies involving trauma and diseases (e.g. critical illness myopathy, SIDS, sleep apnea). In the area of cell biology, we focus on the immune system, viral infection, and therapies that will impact heart disease, cancer, AIDS, and autoimmune disease. Our contributions in physiology include studies dealing with conditions such as colitis, cystic fibrosis, and tumor growth. We employ the most contemporary and sophisticated techniques in biochemistry, electrophysiology, microscopy, and molecular biology. We have facilities and offices in the Biological Sciences and Medical Sciences buildings and White Hall on the WSU main campus. 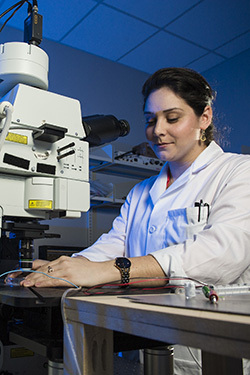 The College of Science and Mathematics and the Boonshoft School of Medicine have established a strong infrastructure for research, including major shared instrumentation (such as confocal and electron microscopes) and our research centers. The School of Medicine also maintains an AALAAC-accredited Laboratory Animal Resource facility. Available equipment for departmental research includes infrared, ultraviolet, and visible light spectrophotometers, epifluorescence microscopes, fluorescence imaging microscopes, preparative ultracentrifuges, HPLC, atomic absorption spectrophotometers, and liquid and well-type scintillation counters. Excellent ancillary facilities include specialized instrument rooms, cold rooms, dark rooms, and constant-temperature rooms. The Paul Laurence Dunbar Library is the university's main comprehensive library. Wright State University is a member of OhioLINK, a statewide online collection of research databases and full text journals.